Fast food restaurant jobs are an opportunity for many individuals where they get to initiate their workforce or also work as part-time. The recruiters do not expect deep knowledge about the fast food industry and hence, candidates can prepare and focus on other areas in order to get recruited. There are many individuals who start their career as a teenager and then get to the management position. There are a number of questions and answers asked in a restaurant interview. 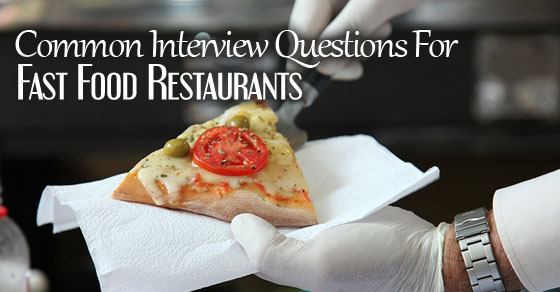 In that context let’s glimpse through few common restaurant interview questions and answers. The following mentioned are few fast food job interview questions and answers. 1. What makes a good restaurant worker? By this question asked in interview, the manager desires to find out the importance of working in a restaurant. Hence for such question, the candidate should mention the importance of developing satisfied customers and also preserving hygienic surroundings. The answer can be as; a restaurant worker requires more skills than organization staffs or factory workers. They must know that it’s important to have a neat and tidy work area. Apart from that, the candidates also need the skill to interact with customers and follow procedures for food preparation. 2. What do you feel about working with customers? Customers are the main key as they are the ones who enhance sales. There are many customers who have their own specific restaurant which they visit each time for good service. When there is poor service the true fact is that customers do not return back. In a fast food industry, the employee needs to change their role often. They are ones who need to prepare food and also serve it to the customers. With this question in interview, the manager would like to know how the candidate would react with the customer. Hence for this question, the candidate must explain real life experiences and also stress the importance of customer service. 3. What makes our restaurant different from our competitors? With this question, the characteristic of the restaurant to the customer is defined by the employee. To answer this type of fast food interview questions, the applicant should know the strength of the restaurant and also compare it with other competitors. The candidate should make sure to go to the restaurant’s website and know how it wanted to be unique. The candidate should mention examples and the way it demonstrates its characteristics. The real fact is that the restaurants usually have the same goal. They desire to serve quick and tasty food. Due to hiring, there is always a high amount of employee turnover in the fast food industry. In order to gain additional income, college students and teenagers opt for careers in fast food industry. Once they have completed their graduation they leave the job and settle down in their career path. This is a common question for interview asked by the manager in order to know how long the candidate would stay in the job role. The candidate should answer this questions asked at interviews honestly and also show dedication to his job role. If the candidate has ideas to grow within the fast food organization he can mention his long term goals. He can answer that he would like to advance and get to a management position. Candidates who desire to switch their career can mention their short term goals with the industry. 5. Why did you choose this fast food job? The real fact is that companies wanted candidates who are passionate about their job. Formulate the answer with few factors that makes your answer perfect for your job role. You can mention that you love to work for customers and have a passion for customer service. You can also add up that you like to serve customers and you obtain satisfaction by helping others. 6. What challenges are you looking for in fast food industry? The way you would make use of your experience and skills is one way by which you can bring about the answer to this question. You can always mention that you love to face challenges and would be motivated to meet them. Open up that you have the flexibility, skills and capability to meet challenges that pop up in the industry. Remember to add more points to your answer by mentioning your previous examples and challenges that you have faced. 7. Describe work week for the fast food industry? These usual interview questions are posed to know about the employee’s schedule while they work. It is advisable not to discuss non-work related activities such as leaving your kid at school, going to the gym and more. Your answer should be ones which focus more on work and show that you’re organized. 8. Why should we hire you for fast food restaurant? This is of restaurant manager interview question level, you need to associate your answer with your experience, skills and education to the job role. To answer this question you need to be aware of the company culture as well as the job description. Say that you possess the energy and passion required to fulfill this role. Present your speech to be confident and optimistic which makes them feel that you’re a perfect choice for the job role. Being an energetic person in answering the question can help you score marks. 9. What hours are you available? Suppose you work for part time, mention your complete working hours after college. Do not mention any specifications from your side. Obey to their timings if it suits your part time job. This is because you can opt timings after your college. 10. Have you ever worked in a fast food before? For ones who have experience can mention their experience and make the employees know that you’re an expert in a restaurant or fast food jobs. Experience isn’t necessary but it is surely a bonus point in an interview. For ones who do not have experience can mention that you are a quick learner and would adapt to the work environment and be dedicated to the job role. 11. Why did you want to work here? You can mention that I researched about many restaurants and found this restaurant is doing certain things that I’m interested in. I have a great interest in what your restaurant does and want to be a part of the same. For example, if the restaurant has perfect management skills, then you can mention that you wanted to be a part of the team. 12. What is your favorite part of serving? You can mention that you love challenges often; you view every day in a different way. You look every shift as a brand new surprise and you relish in handling new challenges. You also enhance each day and handle every day better than the previous. You can mention that you love progress and keep progressing each day and you also make your job interesting. 13. Would you be a good addition to the team? It is a team effort to serve and hence your manager would put forth this question to know if you could work well with others. You can also show your answer that you can integrate into the team promptly through your job role. You can say that you’re a team player and also a perfect learner, you are one who assists your co-workers at times they need help. You are a good learner and hence, you learn new aspects from others in your team. You are a good addition to the team as you would enhance your skills and others too. 14. What would you do when a customer gets angry and throws things? At such situations, the employer would like to test your reaction and hence you should answer that you would stay patient and apologize to the customer. 15. Tell me a suggestion which you have made in your previous job and were implemented? It is important to give positive answers to this questions to be asked in an interview, rather than negative ones. Give examples where your idea was implemented and resulted in success. Do not mention failure ones. 16. What do you know about us? Research the company website and get to know details from about us and careers section of the site. Run through the LinkedIn page and learn details about the company. Google search for press releases of the restaurant and update with the latest news. 17. Did the salary we mentioned grab your attention for this job? You can mention that salary is a reason but remember that your salary factor should not dominate your interest. Answer that salary is attractive but the job role is more important. 18. Where would you like this job to land you? You can answer that you would like to work and get to higher management positions and present a positive career path in the industry. 19. What kind of service do you think is better fast or friendly? Answer that friendly service is better because when there is a delay in service, customers wait when you’re friendly. When service is very fast there isn’t any interaction with the customers and hence, the restaurant does not gain a good look. 20. How will this job benefit you in future? With this job, I get a chance to meet new and different people every day, and I also get a chance to interact and work with a team. 21. How can you bring in more customers to the restaurant? You can answer that you would be attentive, smile warmly, serve food fresh and hot, take responsible for issues if there are any and make sure that the restaurant is neat and tidy. The attitude I possess, the speed and service are what makes the customers come back again, dine and relax. 22. Reason for you to leave your previous job? There are many reasons which can be answered for these questions. Some of them can be that your relocated, you did not find the job challenging, you were not paid properly and more. But remember to make your answers reasonable. 23. What are the qualities you think are required to work in a fast food restaurant? Key qualities required to work in a fast food restaurant are quick thinking, good understanding, patience, and being sharp. 24. Do you have any questions to ask us? This question would usually be asked at the end of the session. Remember not to ask about salary, the location of the job, perks and leave. Instead, you can ask about the new programs be followed and ways you can enhance within the restaurant with those programs. 25. What is your greatest weakness? Employers pose this daunting question but like to hear something positive from your answer. Make the answer a two-part one, initially, make a confession and then give a response about how you would overcome the same. By this way, you would mention your weakness and also know ways to cover it up. The restaurant business is one such kind of business which works fine, even though it is a very competitive industry. Moreover, jobs in restaurants are very preferable, especially for students who like to work part-time. But due to the financial economy, even restaurants are hesitant in employing many like before and are interested to hire only a few, out of many who approach them. What is the reason to pursue a career in the restaurant industry? What is your conflict resolution system among coworkers? Do you have any info about our restaurant? What according to you is ‘hospitality‘? What is your favourite pass time activity? What would you do, if a customer uses an expired coupon? Share any of your favourite customer service experience? Which part do you think is the best in serving? Which is the least likeable part in serving? Are you flexible with working hours? Are there any type of customers you would be reluctant to serve? Explain about your work experience? Do you know anything about this restaurant? What made you think about working for our restaurant? Share one thing which you disliked in your previous job? What is the reason to work in our restaurant and not any other? Do you have any idea about a typical workday at our restaurant? How long would you serve here? Do you have problems working on weekends and holidays? Do you mind sharing tips with others? What do you think your ex-colleagues would say about you? Share your idea about an ideal boss or colleague? Do you hold experience in all areas of restaurant work? What would be your notice period? What would be your expected salary? What interested you to work in the food and beverage industry? How would you deal with a customer who had written a flawed review regarding your service online? Share any interesting hospitality incident you had as a diner? How would your reference describe you? Which part is most important in the hospitality sector and WHY? How would you handle the situation when a customer uses a wrong coupon for the service he is experiencing? These are few common interview questions for fast food jobs that are asked in an interview. Graduates and teenagers who desire to be a part of restaurants as their career can run through these aspects and pave a way for employment. College students many in number lookout for restaurant jobs to work as part-time in order to add more money to their expenses. These questions are common ones and sure to be asked in any restaurant interview. Since the job is customer oriented patience and customer satisfaction is the main aspect, one should bear in mind that working to satisfy the customer and fulfilling their needs must be the employee’s motto. These are key restaurant job interview questions which are beneficial for job seekers. Run through these hints and get recruited in a restaurant without hassles.